Many people hit the roads during the holiday season. Whether a short drive across the town or a cross country haul, driving to see your family is a huge part of the holidays. Road trips before kids look a lot different from road trips with kids and I am not just talking about the extra bathroom breaks! Here are some road trip hacks for families to make your journey easier. This post is brought to you by Autotrader, the leading authority in car buying. All opinions expressed are my own. We bring you tips to keep your little ones entertained, clean and fed during your time in the car. Autotrader provided a Happy Kids, Happy Ride Kit for review and a reader giveaway. As Tara Trompeter, managing editor at Autotrader says, “Family time in the car can be a great opportunity for making memories — or a recipe for grunts and grumbles. A little bit of planning ahead before you get on the road will go a long way toward filling the experience with more fun and laughter for everyone involved.” I agree completely. As long as you prepare beforehand, family road trips can actually be a lot of fun! So here are my best road trip hacks for families. When you have kids in the car, you don’t want to have to make any additional stops! So go ahead and make sure your car is fully ready to go a few days before your family road trip. Fill up with gas, check the wear and pressure on your tires, and be sure your fluids (oil, coolant and wiper fluid) are topped off. This one is not only a time saver later, it is also a safety priority. 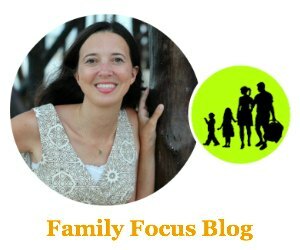 When your kids start to whine or get irritable with one another, they are often just hungry. Have some healthy snacks for on the go available in the car so you don’t have to stop. Also make sure your have a trash bag or garbage container so you can keep unfinished food from turning into a mess. Autotrader also has some great Mom Hacks to help parents hit the road hassle-free this holiday season such as empty coffee creamer bottles into spill-proof containers for your kids’ favorite cereal or chips. You may be lucky enough to skip this one but many young children can get motion sickness in the car. Peppermint and ginger are great for calming nausea so you may want to carry some essential oils, peppermint gum, or ginger chews. You may also want to load the car with some handy tupperware bowls with snap on lids just in case they feel it coming on and wet wipes. Check your route for family-friendly stops along the way such as a zoo, park or other tourist destination to give kids something to look forward to while breaking the trip into manageable pieces. Coloring books and crayons are great for keeping kids entertained just make sure you have a container to hold the crayons neatly such as an old diaper wipe box. Books are great but only if your child is not prone to motion sickness. Mad Lib books (affiliate link) are also fun activity books for the road trip. My son has to have a few stuffed animals or action figures because he loves pretend play. Cards with a rubber band wrapped around them or in a plastic bag are also great for road trips. 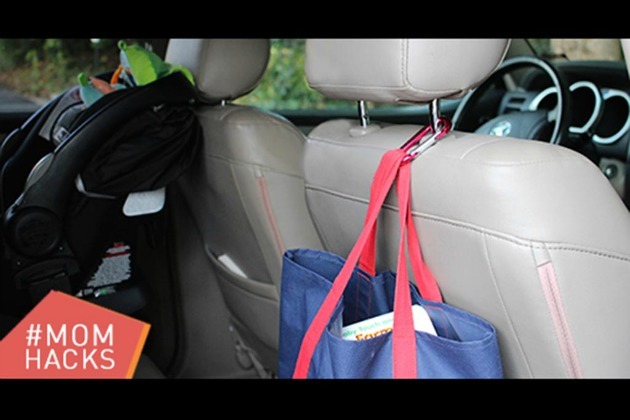 Use the AutoTrader Mom Hack to get it all organized into a tote and hang it from the back of the front seat with a carabiner! Fun road trip games include Beetles and Bugs, 20 Questions, Act It Out, I Spy, Memory. You can find road trip game descriptions and rules here. Some road trips are so long that you may have to resort to technology. Many new cars have features like built-in screens and DVD players but if your car doesn’t come equipped with these, don’t fret. Mine doesn’t either! Consider bringing along a handheld device such as a phone or tablet on which little ones can play games or watch videos. Have these fully charged before you leave and bring a charger along with you too. 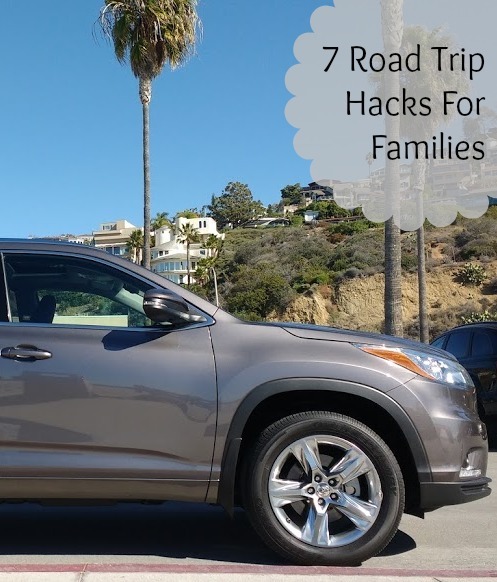 I hope these road trip hacks for families help you have a smooth fun family road trip to your destination. Don’t forget to plan for extra travel time because there will likely be some unexpected stops! 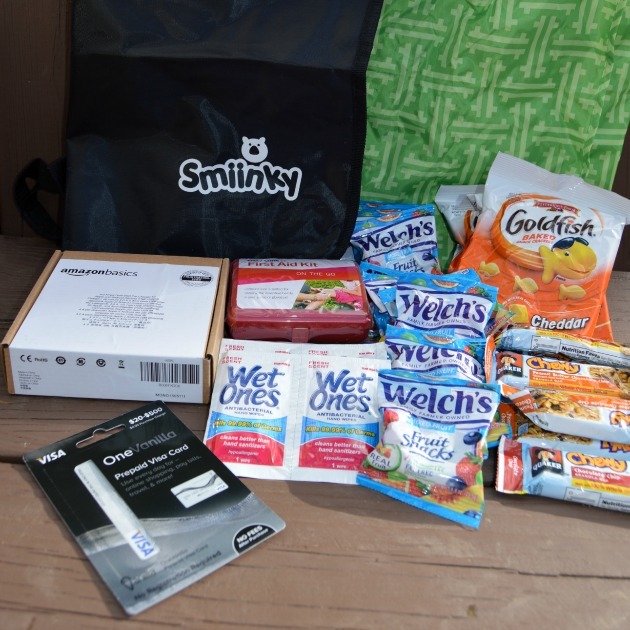 Also, enter to win this Autotrader Happy Kids, Happy Ride Kit for an extra smooth road trip. How to Enter: Enter through Giveaway Tools- just sign into the widget and click the entries you want to complete (comment or share). Winner announced above in the Giveaway Tools widget on December 29, 2015. Winner will be selected through Giveaway Tools and I will notify by email. Winner must respond within 4 days or the prize will be forfeited and alternate winner will be chosen. Your email will not be shown and will be kept private. Are you planning a road trip sometime soon? Do you have any road trip hacks for families that work well for you? Love the idea of using the empty coffee creamer bottles as snack containers. We have lots of those and 5 little ones. Very fitting for us and very practical. I love the idea of using small muffin cups to collect and organize loose change. Keep art supplies under control by simply adding some paper and colored pencils to an old DVD case so your child can take them anywhere. I have done this. I love the idea to hook a carabiner to the handle above your kids’ seats to put bags on. I love the use of small muffin cups to collect and organize small items. Use a plastic cereal container as a mini on-the-go trash can. Great Mom Hack!!! great idea to use empty coffee creamer containers! Use a plastic cereal container as a mini on-the-go trash can. My favorite is the plastic cereal container as a mini on-the-go trash can. My favorite is the use of small muffin cups to collect & organize small items. I like the tip to use a plastic cereal container as a trash can. Hook a carabiner to the handle above your kids’ seats and hang their bags on it. They’ll be able to reach without distracting you, and you’ll save some extra space on the floor. Keep toys and snacks organized by mounting a shower caddy onto the window with suction cups or placing an over-the-door shoe organizer on the back of the front seat. My favorite hack is to use small muffin cups to collect and organize loose change. I really like the mom hack to Use small muffin cups to collect and organize loose change. Great idea to use plastic cereal containers as car trash cans. I like the muffin cups in the cup holders idea. Love the seat cubbie idea! Keep some colored pencils and paper in an old dvd case so your child can anywhere, I love this! Using an old DVD case for art pencils is brilliant! My favorite Mom Hack is placing an over-the-door shoe organizer on the back of the front seat. My favorite mom hack from AutoTrader.com is use plastic wrap for a makeshift lid on any cup and help prevent spills in the back seat. Stick a straw in the center for easy drinking and preventing mid-drive messes. My favorite is Hook a carabiner to the handle above your kids’ seats and hang their bags on it. Love the idea to place an over-the-door shoe organizer on the back of the front seat to put things in. My favorite tip is Keep art supplies under control by simply adding some paper and colored pencils to an old DVD case so your child can take them anywhere. Oh I love the mom hack….Use small muffin cups to collect and organize loose change! So clever! I like the idea of using an old cereal box as a mini trash can in the car. Recycled coffee creamers as snack holders are brilliant! Definitely gonna save those now. Use small muffin cups to collect and organize loose change. My favorite mom hack is the shower caddy hanging over seat to store necessary road trip items. I would go to the dollar store buy 20 bucks worth of toys keep them in a box by there feet then when they get cranky give them a new toy. Works like a charm also prepare little snack size baggies filled with goldfish mini cookies etc. Have a cooler filled with ice cold water. I like the Momhack to hook a carabiner to the handle above your kids’ seats and hang their bags on it to save some extra space on the floor. Use small muffin cups to collect and organize loose change. Great idea it will keep spills from causing a big mess to clean up. I’m going to use the silicone ones to keep mine clean. I always keep an extra pair of clothes for each of us in the car, because you never know when one will be needed! My favorite is Use a plastic cereal container as a mini on-the-go trash can. Thank you! I like the Turn empty coffee creamer bottles into spill-proof containers. That is a great upcycle idea. We travel for work, plenty of items here would help, especially the organizer. I like the hack for using a plastic cereal container as a mini trash can. Turn empty coffee creamer bottles into spill-proof containers for your kids’ favorite cereal or chips. I like using the cereal container as a mini trash can. I really like the idea Keep art supplies under control by simply adding some paper and colored pencils to an old DVD case so your child can take them anywhere. I like the small muffin cups to collect and organize loose change. I love the muffin cups hack. My cup holders always seem to get dirty! This is a great way to prevent that. Use plastic wrap for a makeshift lid on any cup and help prevent spills in the back seat. Stick a straw in the center for easy drinking and preventing mid-drive messes. …Genius idea right there! I can’t tell you how many of these messes I’ve cleaned up! My favorite hack is the Use small muffin cups to collect and organize loose change. My favorite mom hack is using a plastic cereal container as a mini on-the-go trash can! My favorite hack is using Plastic cereal containers as a mini trash can. Hook a carabiner easy to grab stuff when it is not on the floor. I like the idea of reusing empty coffee creamer bottles as snack containers, I would have never thought of that. I like the tip about the coffee creamer bottles and turning it into a spill-proof containers for snacks. This seems like an awesome giveaway! My husband, daughter & I just took a 17 hour long road trip to Disney World during the summer. Our daughter is almost 4. What I did to entertain her was — I went to the Dollar Tree and bought about $15 worth of activities/toys. She LOVED it all. I didn’t give any of it to her until the actual road trip. Every hour or so I would give her a new activity or toy. She enjoyed it because kids her age are all about quantity not quality. It worked out really great for us! plastic cereal container for the trash Genius!!! I like the hack, Use a plastic cereal container as a mini on-the-go trash can. I like the idea to use small muffin cups to hold loose change. I like the muffin cups and the carabiner hacks. Both are very useful to me. I enjoy your blog, but I have a major problem with the GT form here. It always comes up blank and doesn’t remember me from one visit to the next. It even clears out when I’m on the same page and post a comment. I never have this problem on any other blog so please look into why it’s doing it on yours. I like the Keep toys and snacks organized by mounting a shower caddy onto the window with suction cups hack. My favorite mom hack is the one where you use a plastic cereal container as a mini on-the-go trash can.